"Chaunce" is a very nice 2004 Cruisers 370 powered by Twin Mercruiser 8.1L Horizon Fresh Water Cooled Engine Inboards with only 400 hours. She has Kohler Generator with 90 Hours. Full Enclosure, Full Swim Platform, Cockpit Entertainment Center, Radar, GPS, Windlass, Cabin has new beautiful Oak flooring, Full Galley, Private Cabin forward, Vacuflush head, Separate Shower, Aft Settee, Cherry Cabinetry throughout. Come take a look - so much to see!! The 370 Express features an Elevated Helm Deck for good visibility and Cockpit room. The Captain has a double-wide helm seat with bolsters. Portside of the helm is a Crescent-shaped Companion Seat at the same level as the Captain's seating. The 370, like all Cruisers features a Walk-Through Windshield for excellent easy access to the Foredeck. The Cockpit Seating is U-Shaped and wraps the Cockpit's starboard side, a fiberglass Cockpit Table converts the Cockpit eating into a Sun Lounge. To port of the Cockpit seating is a wetbar with sink basin, loads of storage and an U=Line Icemaker. 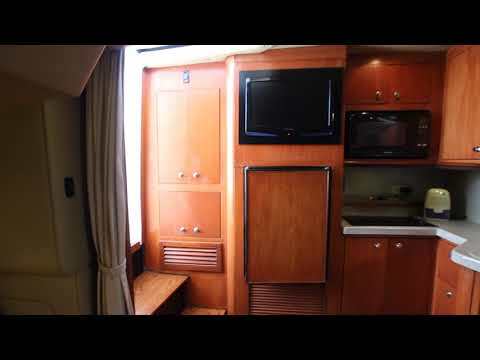 The Interior Layout of the Cruisers 370 Express is best described as HUGE. 6' 6" of Cabin Headroom, a Full Head with Stall Shower, but the defining feature of this design is the Aft Convertible Sofa in lieu of a step-down cramped mid cabin. This aft sofa expands the Salon to include the entire cabin area. The sofa is convertible into a double berth and an aft curtain insures privacy and comfort when desired, but when entertaining this design nearly doubles the usable salon area. The Forward Master features a Double Berth, a Bulkhead with Privacy Door, and Dual Hanging Lockers. A Convertible Crescent Dinette gives the 370 a sleeping capacity of five in comfort. The Head compartment is equally large, features a tile sole, solid-surface counter, and a genuine STALL SHOWER!! The Cruisers 370 Express features a sleek express exterior with plenty of cockpit space and a well-thought-out layout, effectively combining abovedeck comfort with a sweet, performance-driven profile. Most importantly, owners can select from two interior layouts. With the single stateroom layout, the 370 achieves a wide-open feel. The airy salon is one continuous living space from the forward stateroom to the comfortable aft settee. The double stateroom layout offers a midcabin stateroom with twin berths instead of the settee. In either case, the 370 is able to comfortably provide sleeping accommodations for five people and has a generous 6-foot, 6-inch headroom. Another benefit of the 370 is a galley layout that positions the refrigerator conveniently at eye level, which also allows for more storage in the galley. This arrangement is located in close proximity to the cockpit for additional convenience when entertaining or relaxing topside. The forward stateroom, which can be closed off by either a standard privacy curtain or an optional bulkhead and door, boasts a large double bed that is easily accessible for maximum convenience. Additionally, the main head features a separate shower stall, in keeping with the idea of maximizing privacy, comfort and ease of use for those living aboard. Chaunce is located at our marina.